Before that, I would like to mention that this is just my list of Top 10, it has no relation to actual Top 10 movies, it depends on you how you judge a movie. The movies mentioned in this list are judged by all around facts and not just Highest-grossing. Also, Life of Pi (starring Irrfan Khan) is a Brilliant movie but it is a Hollywood movie so does not belong to this list. Whatever you say, but I believe that Irrfan Khan deserves awards for his Performance in Paan Singh Tomar. A sensational story of a sportsman and circumstances that forced to change him to a Dacoit. Excellent Script, Fabolous Dialogues and great direction. Background score could have been better. Who would have ever thought that such a low-budget movie would be such a great success. Even I thought that this movie will come and go and remain forgotten. But, this movie proved to be excaptionally good at least far better than what I excepted. Nice Music and grest performance by Star Cast. Hats off to Dr. Chhadda. Ever thought of watching a South Indian movie and the movie resulted in being out of plot. This movie would definitely contradict this fact. What a height of Imagination ? How can even a House Fly play the main role in a Movie ? Rajamouli has broke several records of Imagination and gave us a new Super Hero i.e Makkhi. Ranbir Kapoor has again proved that he is no less than the great Khans. Priyanka Chopra definitely deserves Filmfare for his role of 'Jhilmil'. Illenea D'Cruz has entered Bollywood with this Beautiful romantic story. Though some scenes are copied, but removing those copied scenes does not take away the beauty of the Film. First sight of this movie gives us a look of 'stupid, rural movie'. But I must tell you this movie was one of the best movie based on rural lives. Gangs of Wasseypur seemed to be somewhat boring but Gangs of Wasseypur II proved to superb. Anurag Kashyap really got every nerve out of me. After so long time, Sridevi was back with her fabolous movie, i.e English Vinglish. Some scenes of this movie will even make the toughest person cry. After watching 'Dirty Picture', I swore not to watch any more movie of Vidya Balan. But this one deserves thrice watch. Excellent performance of Vidya Balan. Best movie ever driven by a Female Actor. Though most of you won't like this movie but I had liked this movie. Ending script is not good but Suspense in the first half is just awesome. Though this movie was not so good, it was better than other Khans movie. 9. OMG : Oh My God! I rushed to the Ticket counter to buy tickets for this movie, considering it to be good. It proved average as the second half seemed to be too much stretched and unconceptional, thought the idea of driving God to court was appreciable. No words for this movie. Not a very bright plot but watchable. Intense political thrill. Emran Hashmi has proved that he is more than a lover boy. Ek the Tiger, Jab tak hai Jaan, Student of the Year, Agneepaath, Bol Bachchan and Cocktail are other movies I liked but they were not as good as expected either beacuse of poor plot or strechful films. Everyone has his/her own choice of Movies. This was just my list. You will definitely have different choices. What are the Top Ten movies you liked ?? Please Mention in Comments. All these movies were superhit and proved as good entertaining for everyone. 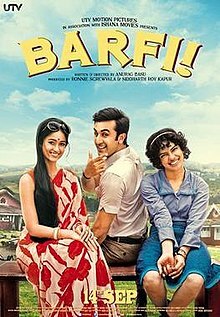 Among the list, my favorite was Barfi. I actually Bollywood movies hilarious moreso the musicals Indian culture is super rich I have learnt a lot about the culture from just watching the movies could you recommend any new releases Gupta.